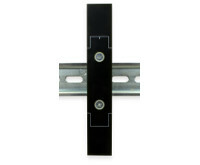 Use these sturdy universal DIN rail mounting plates to mount devices to standard DIN rail. Many devices are not designed for DIN rail mounting, but these adapter plates solve that problem. They feature a flat plate mounting surface to which you can mount your device, and a metal DIN rail bracket on the back of the plate secures the plate to the DIN rail. 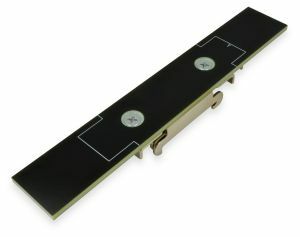 The mounting plate is made of sturdy 0.125" thick FR4 material (glass-reinforced epoxy laminate material). A sturdy steel DIN rail bracket comes installed on the back of the adapter plate. For reference, parts beginning with DINP01 have DINM21 steel brackets, and parts beginning with DINP02 have DINM23 steel brackets. Both of these brackets may be purchased alone if you desire the bracket without the adapter plate. Please note that the different brackets have no impact on the functionality of the DIN plates; they are merely different sizes. These adapter plates are alternately known as DIN rail mounting plates, DIN rail brackets, etc. Several other styles of DIN rail brackets are available here. DINP01-1760A DIN Plate, 1.74" x 6.0"
DINP02-1060A DIN Plate, 0.98" x 6.0"
DIN Plate, 1.74" x 6.0"
DIN Plate, 0.98" x 6.0"
Solid Plate: Drill mounting holes in this plate to match the mounting holes in your device. Note that the outline of the metal DIN rail bracket is shown on the front of the adapter plate; this aids in avoiding the metal DIN clip when drilling mounting holes for your device. 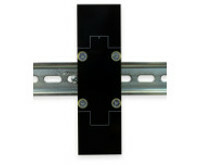 These DIN rail adapter plates are easily attached and detached from the DIN rail. When on the rail, the bracket latches to the rail on both the top and bottom lips of the rail. The bracket should be oriented such that the "fixed" (non spring-loaded) end of the bracket mounts to the top of the DIN rail, thus allowing the fixed end to bear the load. The spring-loaded sliding hooks will then grip the bottom of the DIN rail. This arrangement provides the greatest rigidity and load capacity. Release Handle: Pull the release handle from the bottom, or push it from the top (both ends are part of the same sliding mechanism). This releases the sliding hooks gripping the bottom of the rail and allows the bottom edge of the bracket to swing out away from the DIN rail. The entire bracket can then be lifted off the DIN rail. Lift & Pivot: Perhaps the simplest method is to push up on the mounted device, pivot the top of the device out away from the rail, and lower the entire device off the rail. This technique does not require access to the release slide and is thus very convenient.